I'm a little late in this posting, sorry! 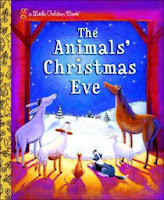 Anyway, for the month of December, I'm going to focus all on Christmas books for kids. I love Christmas. It's my favorite holiday of the year. I can't wait to decorate and start the baking to share with loved ones. Family, friends, lights, music, food, there are so many things that make this time of year shine. Again, I'm going to focus on some of my favorites as a kid and some newly discovered ones. Some old ones I've noticed have been redone and given a new look, while others have stayed the same, but they all bring back wonderful memories. What were some of your favorite Christmas books?